In keeping with the United Nations Declaration, the International Day of Yoga was observed at the Mumbai Ashram center in Nerul on Tuesday, 21st June, 8.00am onwards. The event was well-attended by the students and staff of Amrita Vidyalayam, Ayudh members, and youth members from Ransai, the village adopted under Amrita SeRVe. The event commenced with the auspicious lighting of the lamp, followed by felicitation of the invitees who had graced the occasion. The list of dignitaries on the dais included Dr. Sanjay V.Pattiwar, an experienced medical practitioner, Shri Satish Nikam, co-founder, PODS Ventures Pvt.Ltd, who has been actively working for social causes for the past 15 years, Shri Inder Bhatia, an ardent Amma follower, and Br. Avyayamrita Chaitanya of the Mumbai Ashram center. 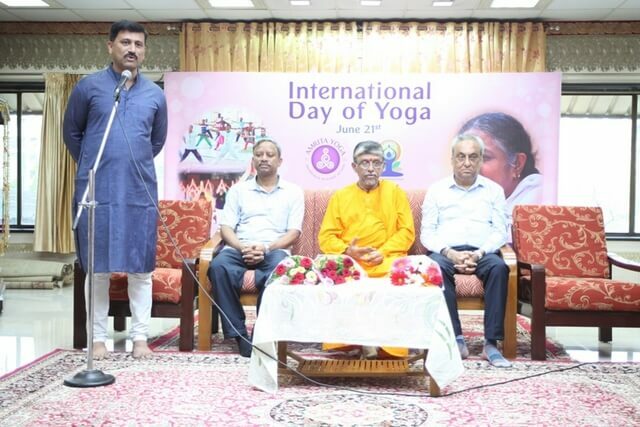 All the dignitaries spoke of the benefits of practicing yoga for holistic wellbeing, and for bringing in harmony at the individual, community, national and global level. This was followed by a session of Amrita Yoga, under the guidance of Brni.Shobhana. The event concluded with a prayer for world peace and harmony.